Why You Should Use A Rebate Site For All Of Your Online Shopping! You are here: Home / Great Deals / Why You Should Use A Rebate Site For All Of Your Online Shopping! I love rebate sites and here’s Why You Should Use A Rebate Site For All Of Your Online Shopping! 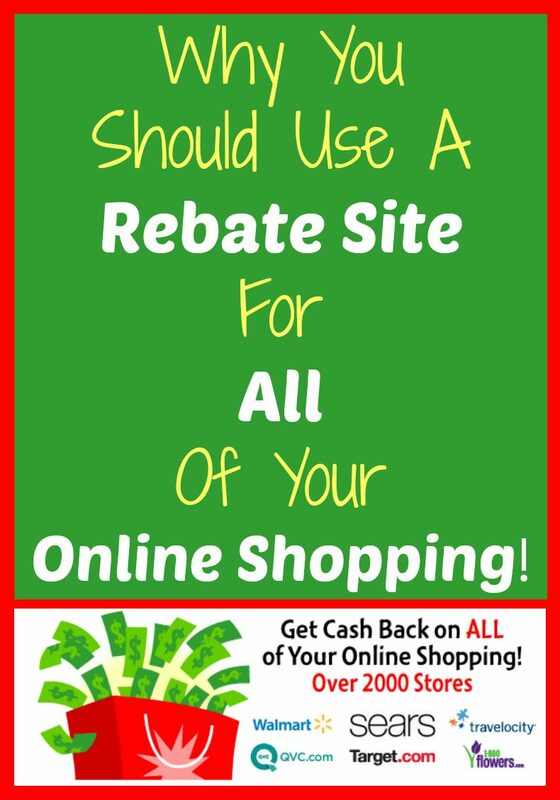 A rebate site is a site that you can go through when making purchases online and they will give you cash back for shopping through their site. Basically you would sign up at the site you choose to use, and then when you are ready to begin shopping online you would go to the site and click “through” their site to the store you would like to shop at and then they will give you a percentage back on your purchases. There are many rebate sites out there to choose from, but, I have chosen to use Mr. Rebates and have used them for several years and have been very happy with them. If you are going to do any online shopping, you really need to choose a rebate site and use it, EVERY TIME you buy ANYTHING online! Why? Because you get discounts and rebates on all of your online purchases! Mr. Rebates gives a $5 sign up bonus and then once you accumulate just $10, you can request a payment, either by Paypal or check! With Mr. Rebates, you just go to their site and either type in the store you are looking for in the search bar or choose one of the links under the search bar to look for a specific type of store. After you have chosen the store you want to shop at, you will see what the rebate amount will be and any specials or coupon offers available through Mr. Rebates for that particular store. Then you click on the offer and it will take you to the store website and you will shop like normal! As you shop online, you will accumulate rebates and get special discounts available only through Mr. Rebates, making your online shopping more fun, knowing you are making money back on your purchases! I love to save up all of the money for the year and then use it for special occasions like birthdays, anniversaries, or holiday shopping at the end of the year! So, it’s a win-win! You start off with$5 in your account and before you know it you will have another $5! I usually check my balance on the last day of the month and if I have enough to request a payment, that’s when I do it, then I get a payment in a few days. If you make a request at the beginning of the month you don’t get paid until the beginning of the next. So, I always request the money on the last day of the month. Disclosure: Mr. Rebates DID NOT pay me or ask me to write this post. The opinions offered in this post are mine. I just made a purchase of $100 for a camera with Target online before I found Mr. Rebates. I’ve now signed up. However, is there anyway to get the rebate for the camera since I’ve already ordered without going thru Mr. Rebates? @Amanda: That would be great! Thanks Amanda! I like Mr. Rebates and Ebates! Thanks for linking up!